Keep your hedgehog fed and warm. 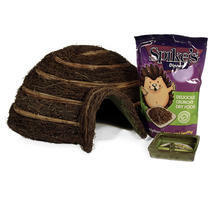 This practical hedgehog set includes a igloo house, feeding bowl and a pack of dry hedgehog food. The igloo house offers hedgehogs and other mammals a safe retreat from the many hazards of modern life and is much safer than the compost heap or bonfire where hedgehogs are in danger from garden tools or the being burnt. The round painted steel frame has a water-proofed roof which is covered with a brush wood finish decorated with withy bands. 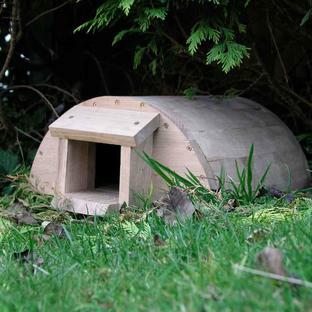 It is spacious and can accommodate family groups such as mother and hoglets. 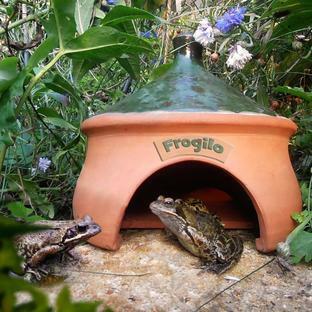 The small entrance tunnel is designed to deter predators such badgers and dogs. 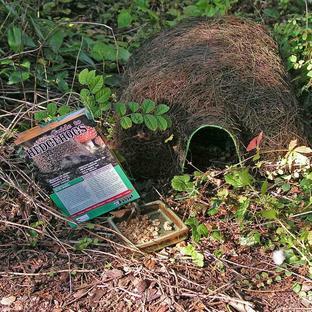 The igloo is predominately designed for shelter but may be used for hibernation if additional brushwood cover is provided over the igloo in winter.